We have been drowning in school supplies at our house the past few weeks. I have been scouring the house for supplies that are still GOOD to reduce buying so many new ones. One thing I did find was a bunch of stuff that would be fun to make into borax free slime for back to school. It is amazing how many partial crayons we had once I started searching the house for school supplies. 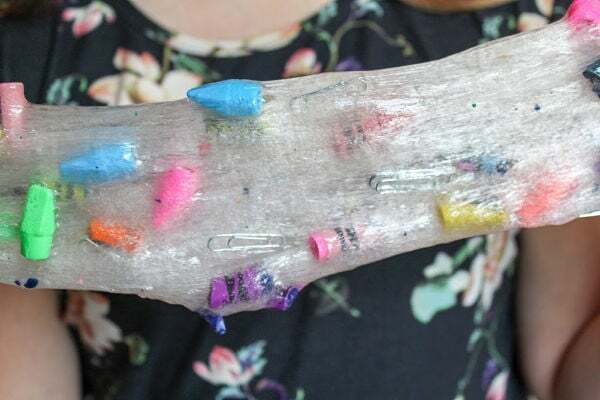 The broken crayons are perfect for a school supply themed slime. I love that this slime is borax free and would make a great gift to friends for back to school time. First you will want to gather your small school supplies. If you have broken crayons those will work great. If not, then just cut some crayons into small pieces. Set these aside for the moment. 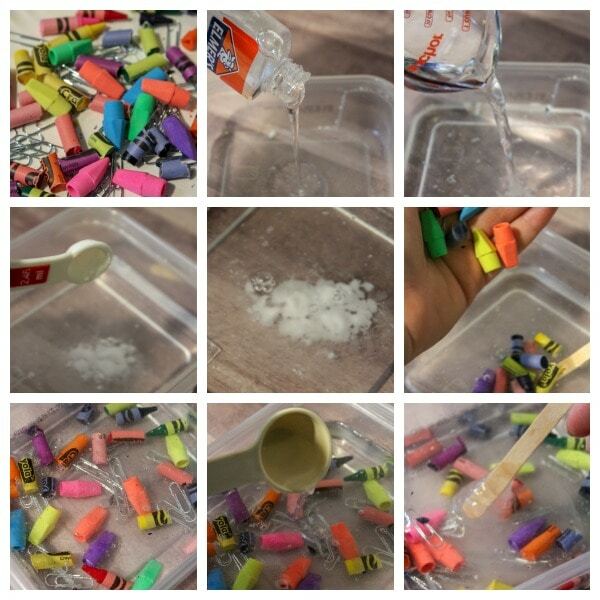 Take a bowl and pour the whole 5 ounces of clear glue into the bowl. Next add in the water and baking soda and stir to combine. Now it is time to add in the small school supplies and stir around. Go ahead and add in the contact solution. This will begin to foam right away. At this point the slime will be sticky. Don't freak out just keep stirring the solution. 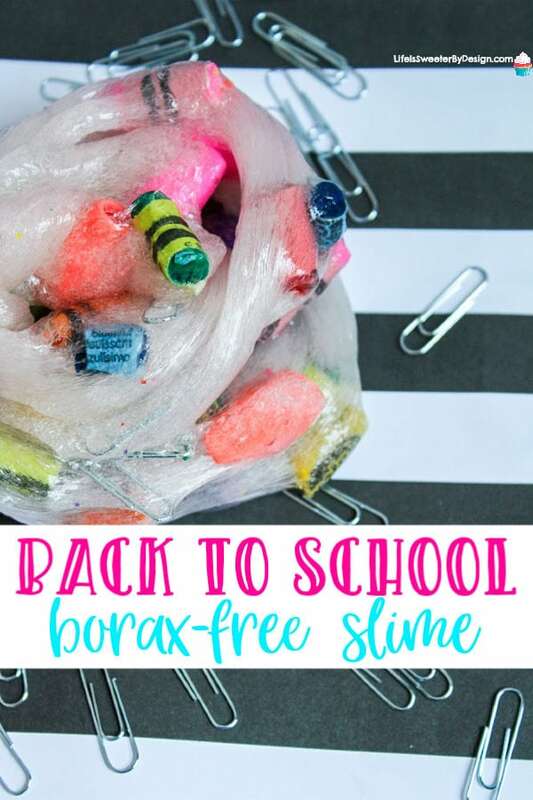 The borax free slime for back to school needs to be kept in an airtight container when not in use! 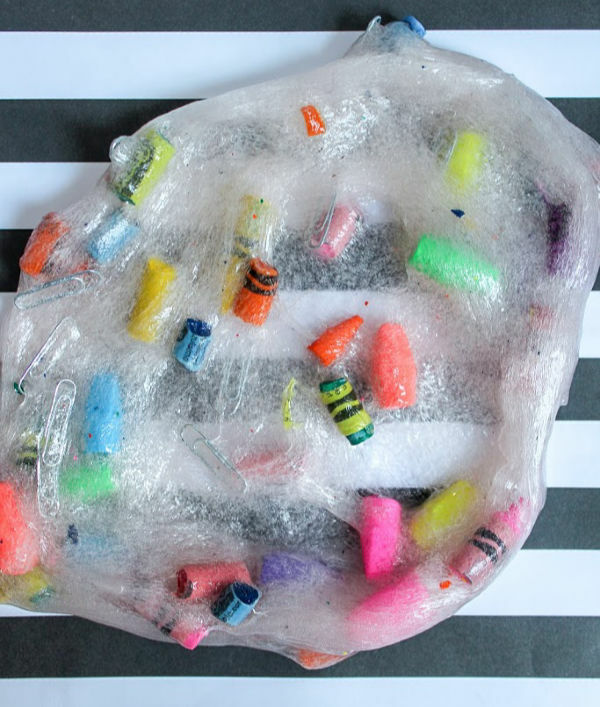 This is a perfect kids slime activity to make using supplies you already have at home. Sometimes it is fun to get some super cute supplies to really jazz up the school supply slime. Here are some really cute things I found! Instead of using regular silver paper clips it is fun to use these small colorful paper clips and the extras can be used at home! I love the colorful pencil top erasers, but I know kids will really love these small animal pencil top erasers in their slime. 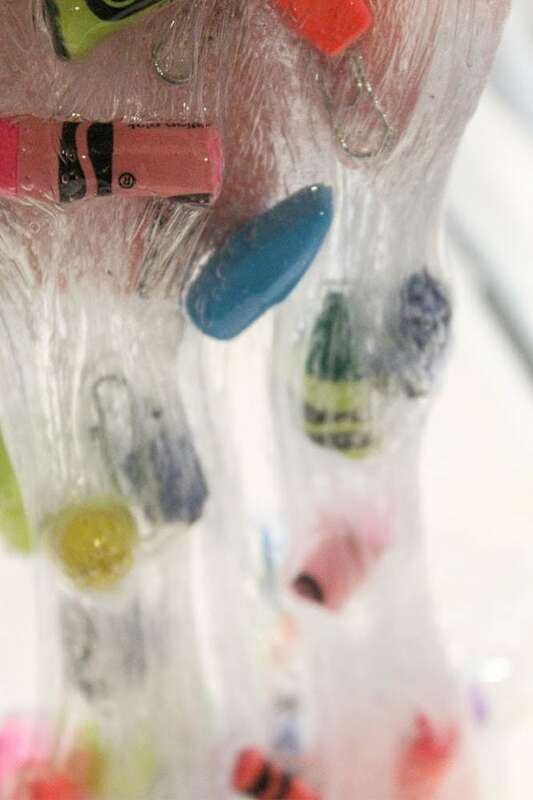 Teensy tiny binder clips are another fun item that could be put into the slime. What Kind of Back to School Fun Do You Have Planned? There are so many fun things to do during the back to school time of the year. Be sure to make some pencil cookies to send in your kids lunches as a surprise!d A fun and easy craft gift for a new teacher is this pencil frame craft!